Information from each included study was recorded in data tables [Table 1]. The primary outcomes were patient-reported pain, LOS, and complications due to inadequate pain management (atelectasis, pneumonia, wound infection, and increase in mortality/morbidity) where reported. Means and standard deviations (SDs) were extracted from the text, tables, or graphs within the studies. Quantitative analysis was limited by heterogeneity in study designs, and the subject numbers were small. The limited number of randomized controlled studies led to a narrative synthesis of the systematic review. Database searches yielded 1875 articles. Further screening yielded 873 articles in which inclusion and exclusion titles and abstracts reduced the number of articles to 52; 52 were retrieved, 13 of which were noncardiac articles, 4 were reviews, 8 were cardiac but nonrandomized controlled trials, and 17 articles failed to meet the criteria during data extraction. Ten articles were included in this study. Randomized clinical trials enrolling a total of 511 patients were included for the final narrative analysis [Figure 1]. Flow diagram for pain management postcardiac surgery shows the search criteria. Parasternal block and local anesthetic infiltrations with levobupivacaine versus Saline (P) showed significantly less use of morphine as a rescue drug in the levobupivacaine (LB) group (P = 0.02) compared to the P group after surgery over the 24 h period. Zero percentage of the LB group needed rescue medication versus 44.4% of the P group. 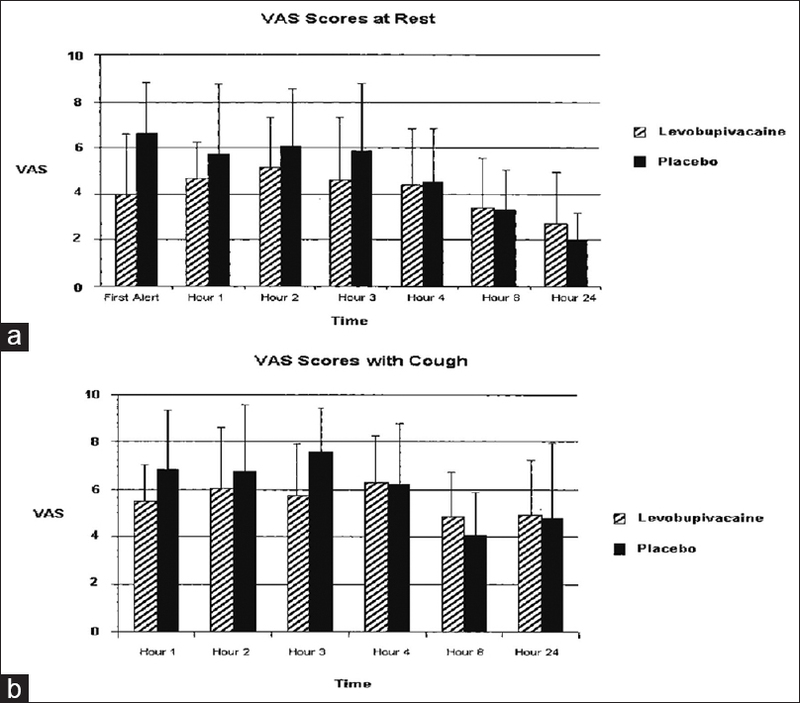 The VAS scores were not significantly different at rest and when coughing, statistically as indicated in [Figure 2]a and [Figure 2]b below. Alveolar-arterial oxygen gradient and partial oxygen were measured and were significantly better in the LB group at the time of extubation and better throughout the first 24 h period. Parasternal intercostal block with ropivacaine for pain management after cardiac surgery, was used in a double blind randomized controlled trial with saline. 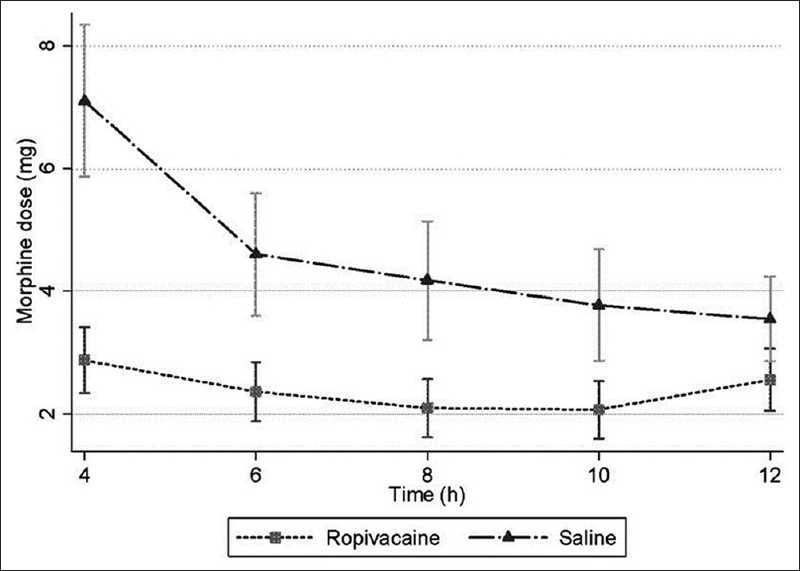 The ropivacaine group had almost 50% visual analogue pain scores less than those in the saline group with a mean of 29.5, SD = 24.3 versus 53.2 = 24.1, ropivacaine versus saline respectively, P = 0.001. Numerical rating scale scores were similarly significantly less for patients in the ropivacaine group at extubation with a mean = 2.7 (SD = 1.6) versus 5.2 (SD = 2.0), respectively; (95% CI: −3.3 to −1.7, P = 0.01). The use of morphine PCA in the ropivacaine patients was approximately 50% less for the first 12 h after surgery (12.0 [SD = 5.4] vs. 23.2 [SD = 8.3] total morphine equivalent in milligrams R vs. S respectively; P < 0.001 [95% CI, −14.3 to −8.1]) as indicated in the graph [Figure 3]. Local infusion of bupivacaine combined with patient controlled analgesia provides better pain relief than intravenous patient controlled analgesia alone in patients undergoing a minimally invasive cardiac surgery. In this study, there were no differences in time to extubation, ICU, or hospital stay. There appeared to be a trend in reduction in PCA requirements when bupivacaine was infused into the wound. The Sham infusion group had greater and more persistent pain than the bupivacaine infusion group even at 24 h, 48 h, and at 3 months after the operation [Table 2]. The time to extubation was shorter in Group B compared to Group C, with a mean of 117 min (±10) versus 195 min ± (19), respectively, P = 0.03. However, there was no statistical difference between the two groups in the ICU and hospital stay duration. 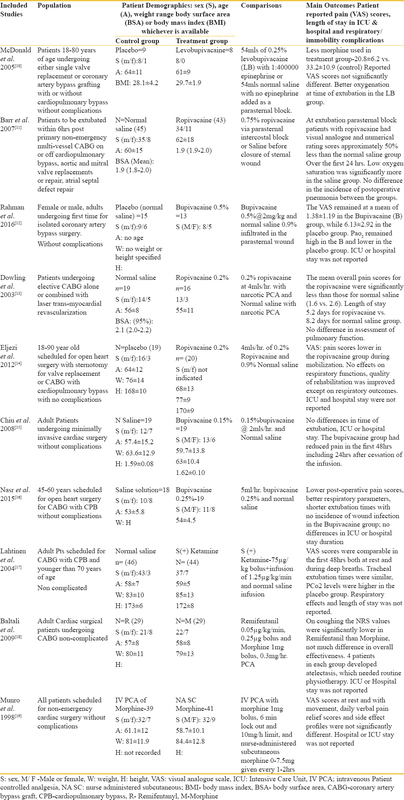 The respiratory parameters such as PaO2/FiO2 and partial carbon-dioxide were better in Group B at extubation, 6 h, 12 h, and 24 h mark compared to Group C [Table 3]. Health Care Association of New Jersey: Pain Management Guideline; 2006. Available from: http://www.hcanj.org/docs/hcanjbp_painmgmt2.pdf. Manion SC, Brennan TJ. Thoracic epidural analgesia and acute pain management. Anesthesiology 2011;115:181-8. Konstantatos A, Silvers AJ, Myles PS. Analgesia best practice after cardiac surgery. Anesthesiol Clin 2008;26:591-602. Behera BK, Puri GD, Ghai B. Patient-controlled epidural analgesia with fentanyl and bupivacaine provides better analgesia than intravenous morphine patient-controlled analgesia for early thoracotomy pain. J Postgrad Med 2008;54:86-90. Werawatganon T, Charuluxanun S. Patient controlled intravenous opioid analgesia versus continuous epidural analgesia for pain after intra-abdominal surgery. Cochrane Database Syst Rev 2005;(1):CD004088. Harle CC, Ganapathy S. Paravertebral analgesia for cardiac surgery. Tech Reg Anesth Pain Manag 2008;12:57-63. Mazzeffi M, Khelemsky Y. Poststernotomy pain: A clinical review. J Cardiothorac Vasc Anesth 2011;25:1163-78. Chaney MA. Cardiac surgery and intrathecal/epidural techniques: At the crossroads? Can J Anaesth 2005;52:783-8. McDonald SB, Jacobsohn E, Kopacz DJ, Desphande S, Helman JD, Salinas F, et al. Parasternal block and local anesthetic infiltration with levobupivacaine after cardiac surgery with desflurane: The effect on postoperative pain, pulmonary function, and tracheal extubation times. Anesth Analg 2005;100:25-32. Barr AM, Tutungi E, Almeida AA. Parasternal intercostal block with ropivacaine for pain management after cardiac surgery: A double-blind, randomized, controlled trial. J Cardiothorac Vasc Anesth 2007;21:547-53. Rahman SU, Siddiqi TA, Husain A, Yaseen R, Tanveer R, Badar S, et al. Efficacy of parasternal injection of Bupivacaine on Post-operative pain for early extubation in patients undergoing coronary artery bypass surgery. J Cardiol Curr Res 2016;6:00210. Dowling R, Thielmeier K, Ghaly A, Barber D, Boice T, Dine A, et al. Improved pain control after cardiac surgery: Results of a randomized, double-blind, clinical trial. J Thorac Cardiovasc Surg 2003;126:1271-8. Eljezi V, Dualé C, Azarnoush K, Skrzypczak Y, Sautou V, Pereira B, et al. The analgesic effects of a bilateral sternal infusion of ropivacaine after cardiac surgery. Reg Anesth Pain Med 2012;37:166-74. Nasr DA, Abdelhamid HM, Mohsen M, Aly AH. The analgesic efficacy of continuous presternal bupivacaine infusion through a single catheter after cardiac surgery. Ann Card Anaesth 2015;18:15-20. Baltali S, Turkoz A, Bozdogan N, Demirturk OS, Baltali M, Turkoz R, et al. The efficacy of intravenous patient-controlled remifentanil versus morphine anesthesia after coronary artery surgery. J Cardiothorac Vasc Anesth 2009;23:170-4. Munro AJ, Long GT, Sleigh JW. Nurse-administered subcutaneous morphine is a satisfactory alternative to intravenous patient-controlled analgesia morphine after cardiac surgery. Anesth Analg 1998;87:11-5. Koukis I, Argiriou M, Dimakopoulou A, Panagiotakopoulos V, Theakos N, Charitos C, et al. Use of continuous subcutaneous anesthetic infusion in cardiac surgical patients after median sternotomy. J Cardiothorac Surg 2008;3:2. Liu SS, Richman JM, Thirlby RC, Wu CL. 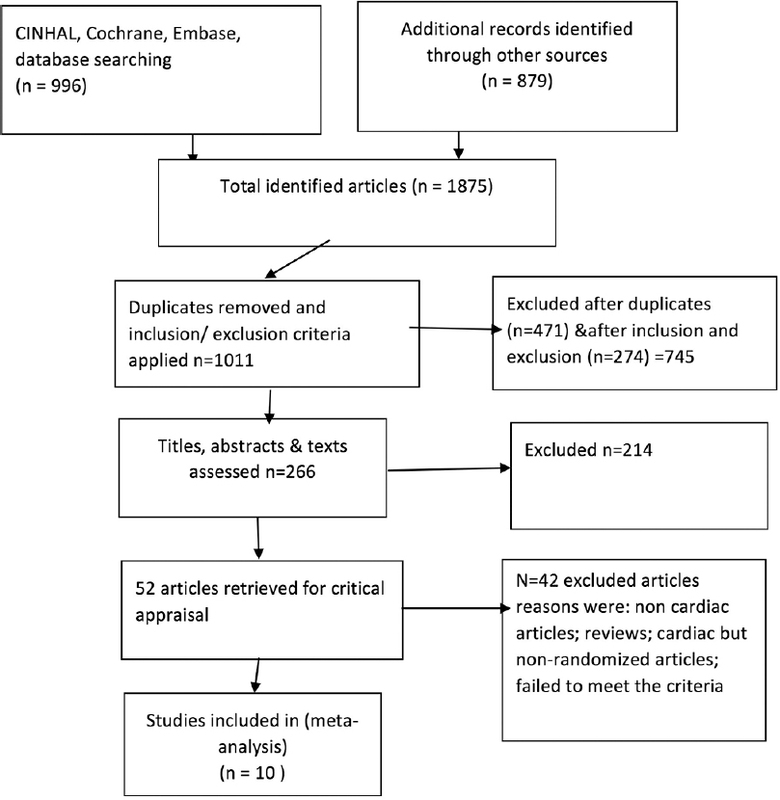 Efficacy of continuous wound catheters delivering local anesthetic for postoperative analgesia: A quantitative and qualitative systematic review of randomized controlled trials. J Am Coll Surg 2006;203:914-32. Joshi GP, Bonnet F, Shah R, Wilkinson RC, Camu F, Fischer B, et al. A systematic review of randomized trials evaluating regional techniques for postthoracotomy analgesia. Anesth Analg 2008;107:1026-40. Møiniche S, Jørgensen H, Wetterslev J, Dahl JB. Local anesthetic infiltration for postoperative pain relief after laparoscopy: A qualitative and quantitative systematic review of intraperitoneal, port-site infiltration and mesosalpinx block. Anesth Analg 2000;90:899-912. Marret E, Bazelly B, Taylor G, Lembert N, Deleuze A, Mazoit JX, et al. Paravertebral block with ropivacaine 0.5% versus systemic analgesia for pain relief after thoracotomy. Ann Thorac Surg 2005;79:2109-13. Bainbridge D, Martin JE, Cheng DC. Patient-controlled versus nurse-controlled analgesia after cardiac surgery – a meta-analysis. Can J Anaesth 2006;53:492-9. Gurbet A, Goren S, Sahin S, Uckunkaya N, Korfali G. Comparison of analgesic effects of morphine, fentanyl, and remifentanil with intravenous patient-controlled analgesia after cardiac surgery. J Cardiothorac Vasc Anesth 2004;18:755-8. Radvansky BM, Shah K, Parikh A, Sifonios AN, Le V, Eloy JD, et al. Role of ketamine in acute postoperative pain management: A narrative review. Biomed Res Int 2015;2015:749837. Subramaniam K, Subramaniam B, Steinbrook RA. Ketamine as adjuvant analgesic to opioids: A quantitative and qualitative systematic review. Anesth Analg 2004;99:482-95, table of contents. Laskowski K, Stirling A, McKay WP, Lim HJ. A systematic review of intravenous ketamine for postoperative analgesia. Can J Anaesth 2011;58:911-23. Elia N, Tramèr MR. Ketamine and postoperative pain – a quantitative systematic review of randomised trials. Pain 2005;113:61-70. Himmelseher S, Ziegler-Pithamitsis D, Argiriadou H, Martin J, Jelen-Esselborn S, Kochs E, et al. Small-dose S(+)-ketamine reduces postoperative pain when applied with ropivacaine in epidural anesthesia for total knee arthroplasty. Anesth Analg 2001;92:1290-5. Jaksch W, Lang S, Reichhalter R, Raab G, Dann K, Fitzal S, et al. Perioperative small-dose S(+)-ketamine has no incremental beneficial effects on postoperative pain when standard-practice opioid infusions are used. Anesth Analg 2002;94:981-6.